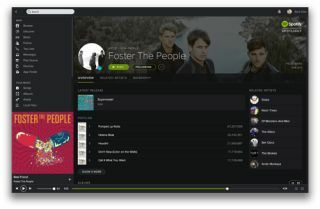 Spotify introduces new-look interface with improved features | What Hi-Fi? Spotify has launched a new-look interface with a darker theme, improved typography and iconography across all platforms. Spotify has also announced a new feature called 'Your Music', which helps users "save, organise and browse your favourite music the way you want to". Albums and artists can be saved "for every mood and moment" in one collection. Users will also be able to access more "relevant and localised content" in terms of playlists for different occasions and moods. Director of Product at Spotify, Michelle Kadir, said: "We want to make sure Spotify users enjoy the best-looking experience of any music service – one that's easy to use and consistent across all devices." The new design, Your Music and Browse features be available to iPhone, desktop and web users from today, with all others platforms receiving an update soon.